theAd>>This is a completely new idea to replace or supplement a birthday or greeting card. 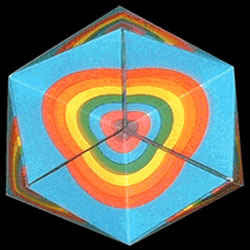 Developed at Princeton University by Nobel prize-winning physicist Richard Feynman. 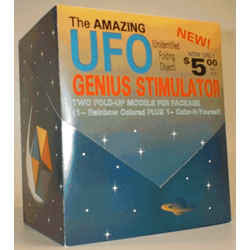 We call it the Amazing UFO(Unidentified Folding Object)GENIUS STIMULATOR. 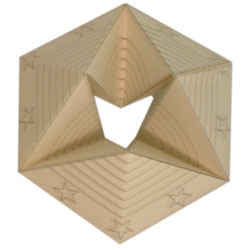 Two(2) 6"x15" easy-fold cardboard models per package: one rainbow PLUS one color-it-yourself that fold into 6" rings which miraculously rotate inside out and defy logic. $4.99 per package(plus $1 shipping). Remember the joy of coloring? I can only imagine the joy on the young faces of my nieces and nephews when I "supplement" their cards with a genius stimulator rather than that same old $2o. I am sure they will call me some Ve-r-r-r-r-r-y Interesting names. Oh, and Richard Feynman died in 1988 so I am not sure how new this idea is. He did help work on the atomic bomb, an unidentified falling object. 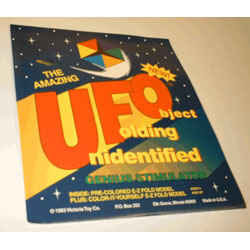 Labels: Makes a Great Gift?, WTF?